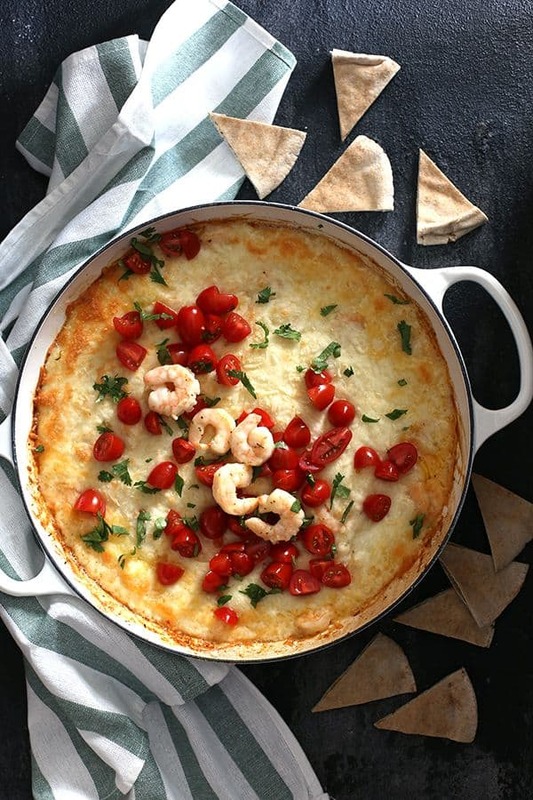 This Shrimp Scampi Queso Fundido is your favorite seafood entree turned melted cheese dip! Shrimp, garlic butter, red peppers and onions are swirled throughout molten mozzarella before being topped with tomatoes and parsley. Grab some pita chips, this amazing appetizer disappears quickly! This recipe was written in partnership with SeaPak. As always, all thoughts and opinions are my own. Thank you for supporting this brand that allows me the opportunity to create content for Melanie Makes. The weather is getting cooler, the pages of the calendar are being flipped at an alarming rate and they both have me thinking of comfort food and appetizer season. You know, the season between October and January where there’s a million holidays, sporting events and get togethers with friends and you’re snacking like no tomorrow. I really love it and I have a feeling I’m not the only one! So I figured I better get my act together and come up with a signature dish to share and friends, this Shrimp Scampi Queso Fundido has good times written all over it! Queso fundido you say? It literally means molten or melted cheese. I know, right? Where do you sign up? It typically contains chorizo and salsa and uses tortilla chips as dippers but I decided to put a bit of a different spin on it. More like bruschetta or Italian style appetizer. So gone is the sausage, Monterey Jack cheese and cilantro and enter shrimp, mozzarella and parsley. My secret to getting in and out of the kitchen and back with my friends and family to enjoy all the cheesy goodness before it disappears is SeaPak’s Shrimp Scampi. SeaPak is also the secret to my cheesy Shrimp Parmesan Sandwiches, flavor packed Roasted Tomato and Shrimp Gazpacho and Shrimp Bacon and Kale Parmesan Pasta, which is comfort food at it’s finest. So good! Although SeaPak makes it easy to get a delicious meal – or appetizer! – on the table quickly, I particularly love this brand because they source only from suppliers who work to limit environmental impact, working exclusively with those who follow the most responsible harvesting practices. 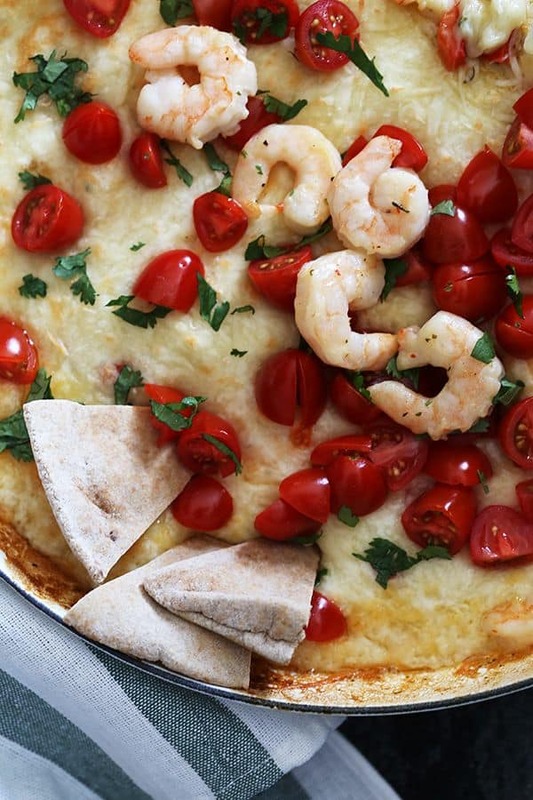 This Shrimp Scampi Queso Fundido is your favorite seafood entree turned melted cheese dip! 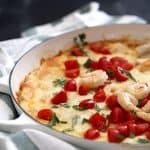 Shrimp, garlic butter, red peppers and onions are swirled throughout molten mozzarella before being topped with tomatoes and parsley. Grab some pita chips, this amazing appetizer disappears quickly! And did I mention the cheese pull that is possible with this dip? The true sign of amazing appetizer greatness! You can never have too many shrimp recipes in your appetizer or dinner playbook. I’m adding these easy Shrimp Bacon Sliders to my next party spread and this Quick and Easy Mexican Shrimp Skillet, easy Shrimp Salad and this Linguine Rosa with Shrimp are both going on my dinner menu ASAP! In a large skillet, cook shrimp according to package directions. With a slotted spoon, remove shrimp and set aside, leaving butter sauce in skillet. Add red bell pepper and onion to skillet and saute until beginning to soften. Remove skillet from heat and spoon peppers, onion and butter sauce from skillet to a bowl and set aside. Add 1/3 of cheese to bottom of skillet in single layer, followed by half of the shrimp. Add another 1/3 of cheese over shrimp and top with peppers, onions and butter sauce. Top with half of the remaining cheese, followed by remaining shrimp. 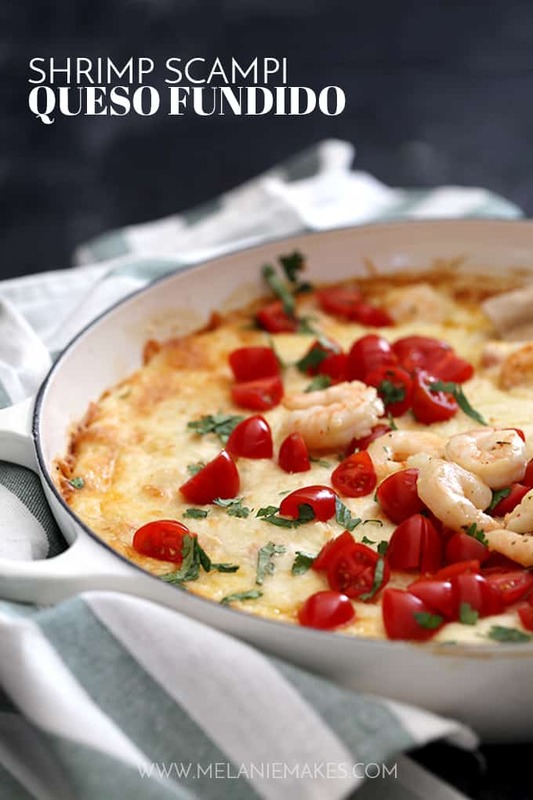 (If desired, reserve a few shrimp to garnish top of queso fundido when you remove it from oven.) Cover shrimp with remaining cheese. Bake for 10-12 minutes or until cheese is bubbly and molten. Garnish with tomatoes and parsley and serve immediately. 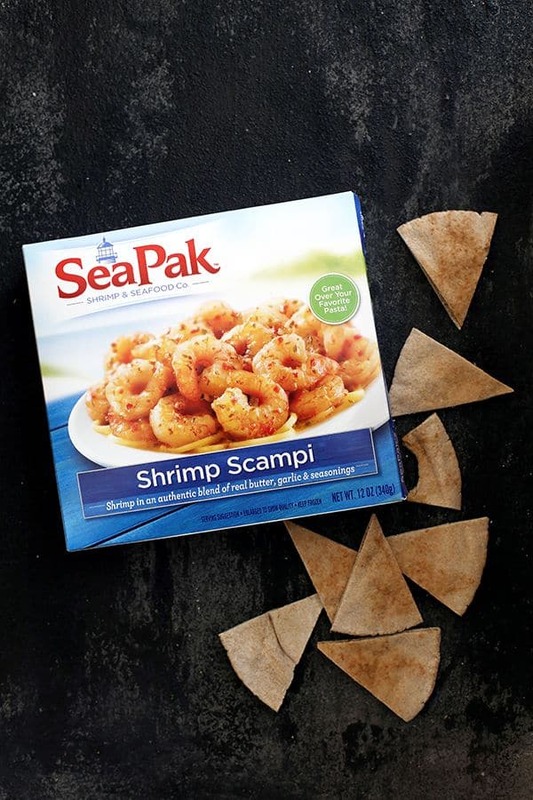 Click here to find a store near you to purchase SeaPak seafood. For more shrimp and facts, fun and recipes, follow the SeaPak on Facebook, Pinterest and Instagram. This looks incredible!! 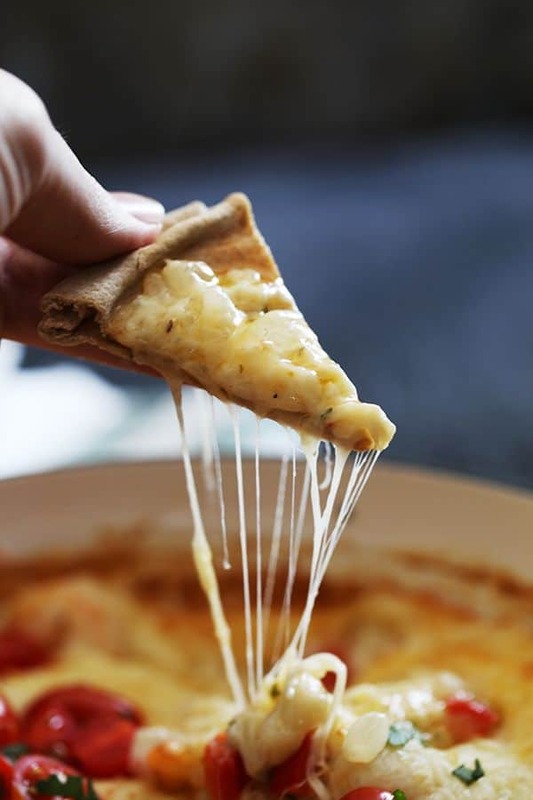 I love seafood dips, hot cheesy ones even more! Weeknight dinner, here I come! That's my kind of dinner, Dorothy!